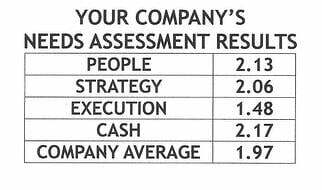 A question that frequently comes up is what should I have Key Performance Indicators for in my business? Certainly there are lot of options. Revenue and profit margin are Key Performance Indicators that everyone should monitor, however these are lagging indicators. What Key Performance Indicators do you have in place that predict your revenue and profit margin? Do you monitor your sales effort and have indicators that report on your sales pipeline? How reliable are these? Do you monitor your variable costs and fixed expenses? Contribution margin is a good forecaster of profit margin as well as gross profit margin. Yet do these give you enough information far ahead of your performance to be true leading indicators? With time and practice whatever number you choose to watch you can discover which key metrics help predict the crucial outcomes in your business. The One Page Strategic Plan suggests other key areas to develop key performance indicators. At the top of the One Page Plan are the two drivers, Process and People. Underneath People [relationship drivers] is room for you to monitor key performance indicators for employees, customers, and shareholders. On the opposite side under Process [productivity drivers] are three more suggestions for key performance indicators including make/buy, sell, and record keeping. You can visit http://www.mygazelles.com/1page/ to view short videos on each of the key sections of the One Page Plan. Start at the top left by moving your cursor in the lower right hand corner of People (Relationship Drivers) and click on the blue arrow for Verne’s short explanation of what to track here. The three lines beneath each description should be filled in with key performance indicators for each heading. For example employees: What is important to measure regarding your employees? You may wish to measure their level of absenteeism, their longevity or their Core Score as Best Buy does to determine their degree of engagement. The latter is a leading indicator based on the 12 Rules for Management that Gallup discovered in their groundbreaking book, First Break All the Rules. 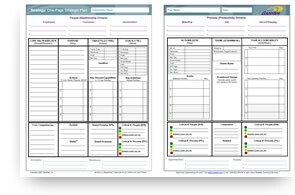 Regardless of what you choose to measure for productivity and relationships in these 6 columns we suggest that two of the indicators be leading performance indicators [predictors] and one be a lagging indicator [outcome]. For more understanding on leading versus lagging indicators check my last blog, Metrics: Leading and Lagging Indicators. If you’re struggling to determine what other key performance indicators you should be tracking consider what we described as Strategic Discipline’s Fourth Discipline: Work Process Flow Charts. What are the key systems in your business and what are the most influential and impactful metrics that provide you with insight into how your business is performing based on their outcomes? Key Performance Indicators are a good reminder of Michael Gerber’s quote, “You can’t manage what you don’t measure, and what you don’t measure you don’t understand.” Make sure you’re business is on the right track by choosing Key Performance Indicators which keep you ahead of where you want your business to grow.